The National Museum of Aden is located in a wonderful colonial building of “Qasr al-Sultan”, in the Crater. Founded in 1966, it is one of the greatest Yemeni museums for number of pieces and prestige. The Aden National Museum gathered a large part of the collection of Kaiky Muncherjee, a rich Indian trader living in Aden, which at the beginning of the 20th century amassed a large quantity of South Arabian antiquities, among which alabaster, bronze and gold objects. The National Museum has a long history of cooperation with foreign missions and researchers. Its huge collection of antiquities had to comprise some 500 pieces, especially from the kingdoms of Qataban, Awsan and Hadramawt: statues, alabaster stelae, incense burners. The museum also has a great number of inscriptions on stela bases from the temple of Mahram Bilqis in Marib, and a collection of bronze objects, including statuettes of lions, lamps and small vessels. Unfortunately, after the civil war in 1994, many of these objects got lost, stolen or destroyed. 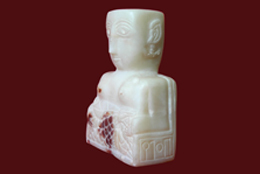 In 2008, a team of the University of Pisa, within the activities of the CASIS project, catalogued part of the collection. Photos are courtesy of the National Museum of Aden. Photos are courtesy of the National Museum of Aden.